Howard Spindel has created and just released the best numismatic resource available to devotees of the Shield 5c series. The Shield Nickel Viewer ("SNV") is a computer program that combines a vast and growing catalogue of Shield varieties with features that permit swift and accurate attributions. 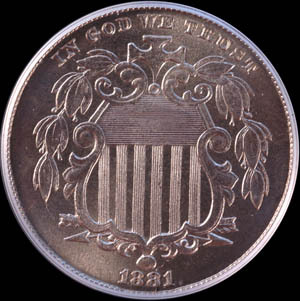 Shield Nickel enthusiasts will immediately understand the enormity of Mr. Spindel's undertaking; and any collector who has experienced the frustration of trying identify a particular variety - say, a repunched date of 1868 or a minor doubled die obverse of 1872 - will quickly realize the benefits of SNV. A trial version of the program is available at www.shieldnickels.net. SNV will find a home in the library (well, on the hard drive) of all serious variety collectors. Mr. Spindel acknowledges the pioneering work of Ed Fletcher and others while advancing their achievements. Mr. Fletcher lists 359 varieties (designated with "F-" numbers) in The Shield Five Cent Series (1994) ("Fletcher"). Bill Fivaz & J.T. Stanton list 111 Shield varieties (designated with "FS-" numbers) in The Cherrypickers' Guide (4th ed. 2001) ("CPG"). Although Mr. Fletcher admonishes us to remember that his research is just "the tip of the iceberg," there is an unfortunate tendency among dealers, collectors, and third-party graders to see the tip as the whole. Far too many misattributions occur by settling for a close match in either book when a true match exists in neither. And, too frequently, the photographs of varieties - which show just a small area of the coin - aren't adequate to confirm a variety or to distinguish between similar varieties. These problems, of course, say much more about the high cost of publishing traditional books than about any shortcoming in the work of their authors. SNV resembles conventional attribution guides to the extent that it contains photographs of varieties. The SNV photographs, however, are digital images not bound by the limits of a printed book. SNV provides high quality pictures of the full obverse and reverse of each coin as well as close-ups of devices and die markers that ensure conclusive attribution. The SNV database presently comprises 400 coins with a total of about 2000 images. At least 110 previously unpublished varieties appear in SNV. The sheer number of varieties clearly demonstrates the wisdom of placing the photos in electronic format. Perhaps even more impressive, the database expands with each submission of a newly discovered variety. A quick "version check" over the Internet reports additions to the database, and those files are always available for download through online updates. Mr. Spindel has devised a new method to track and to organize the vast number of varieties in SNV. Beginning with the letter "S" - which stands for SNV but could just as easily refer to Spindel - each attribution number carries information that classifies the coin. The prefix of each number conveys both the hub pairing and the kind of variety. A three-digit number follows the prefix to designate a particular variety of that kind and hub marriage. In this way, SNV numbers more closely resemble CONECA numbers than either F- and FS- numbers. One who is familiar with the system will recognize an 1867 S2-3007, for example, as a repunched date on obverse A (notched arrowhead) paired with reverse IIa (reverse of '67). Some discomfort always accompanies change. So, to ease the transition, Mr. Spindel provides a cross-reference for SNV numbers and the variety numbers of other attribution guides. The photographs and organization of SNV combine to make it the ultimate catalogue of Shield varieties; but SNV is more than a well-organized photo gallery. SNV comes with powerful tools that assure accurate attribution of varieties in the catalogue. It opens with a "splash page" akin to a spreadsheet in which each variety occupies a row and descriptive information fills the columns. The SNV "filter" feature is the primary tool for finding one variety among all those that appear on the splash page. Application of the filter culls all varieties that do not fit certain criteria, leaving just a few potential matches on the page. Clicking on a possible match calls up thumbnail photos; and clicking on a thumbnail enlarges it to full-screen picture. The "user photo" feature imports photographs of coins for side-by-side comparisons with the SNV plate coins. Remarkably, the images can be resized, rotated, and overlaid with horizontal and vertical grids to assess relative positions of dates and other die characteristics. Collectors no longer need to settle for close matches or to rely on guesswork when attributing their Shield varieties. Using SNV is far easier than trying to describe it. Anyone who has worked with applications for Windows on a PC or with Apple products will intuitively understand the program. The drop-down menus on the tool bar are perfectly clear. The command buttons in the left margin of the page are self-explanatory. Proficiency comes within five minutes of experimentation (likely a bit longer, of course, for someone who is new to either Shield Nickels or computers). The program runs without a glitch. Still, SNV includes an instructional manual, and Mr. Spindel provides support to overcome any problems that might arise. Many Shield Nickel enthusiasts already know that Mr. Spindel possesses expertise in varieties. The ease of using SNV leaves no doubt that he is equally skilled in the art of writing software. No description can adequately explain the advantages of using SNV. A couple of examples from personal experience help to describe its capabilities. 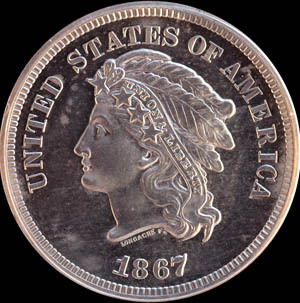 As one example, an auction house recently catalogued an 1868 RPD as an FS-003.3 in deference to an attribution by NGC. The auction house later acknowledged that NGC misattributed the coin and tried to correct the error by describing the coin as an FS-003.7. Importing a photo of the coin into SNV demonstrated, however, that the coin is neither an FS-003.3 nor an FS-003.7. Instead, it is an 1868 S1-3021 that does not appear in either Fletcher or CPG. As another example, a seller recently listed on eBay an 1875 DDO attributed by ANACS as an FS-011.0. SNV left no doubt that the proper attribution is FS-011.3 (1875 S1-1000), a more rare and valuable variety than an FS-011.0. These examples illustrate just two of the many times that this reviewer has benefited from SNV. SNV works well. Maybe dealers and third-party graders should use the program. Then again, we collectors might do better by keeping the advantage to ourselves. Copyright © 2006 Lou Butterfield. Used by permission. A note from Howard Spindel: I am very grateful to Lou for his kind and positive review of SNV, happy to have called him a friend, and always sad that he left us far too soon.